US consumer search interest in credit scores, or the calculated number representing a consumers' creditworthiness, rose 230 percent in a decade. However, that interest appears to be at the expense of interest in and checking of the more detailed credit reports, despite a rise in identity theft and data breaches. A recent analysis of Google Trends search data reveals that US consumers have a growing fascination with their credit scores. In many ways, this is a good thing, as average credit scores have risen over the past decade, and even reached a historic high in 2018. However, an overemphasis on credit scores at the expense of credit reports by consumers, news media, lenders, and others might be helping to create a favorable environment for identity thieves and could lead to an increase in reported fraud losses by consumers. A collection of data from Google Trends, Bing, the FTC, and other sources reveals that while consumers are showing far more interest in their credit scores (the summarized number reflecting each consumers’ creditworthiness), this may be coming at the expense of reviewing their credit reports (the detailed reports about a consumers’ credit history and activity). With data breaches and fraud increasing, consumers’ lack of credit report checking could lead to an increase in financial losses due to identity fraud. Why is increased credit score checking a problem? Ostensibly, a rise in interest for credit scores is a good thing. 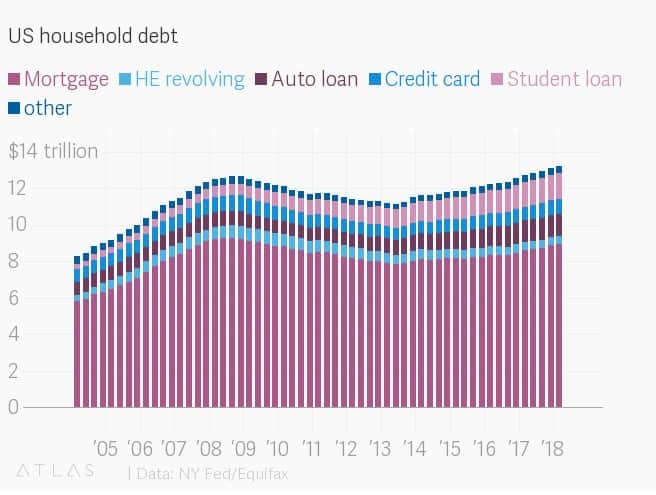 This empowerment over and understanding of credit reflects a positive change in how US adults are interacting with debt. However, consumers’ declining interest in their more detailed credit reports is a subtle but troubling trend. It means consumers are only getting a snapshot of the information factored into their credit scores, and could easily be missing not just inaccuracies across their three Credit Reporting Agency files, but also potentially fraudulent activity that’s hard to spot in a score. Although some good news emerges in the FTC’s Consumer Sentinel reports over the years (including a 17 percent drop since 2006 in reported financial losses from fraud), consumer behavior — as indicated by the FTC’s data, as well as Google Trends search data and other consumer surveys — reveals a growing scenario that could easily lead to larger fraud losses in the future as consumers are likely to respond more slowly to fraud. Notably, consumers are also less likely to check their credit reports when their credit scores are good or when their credit card debt is high. Having a good credit score or carrying a large amount of revolving debt appears to make consumers more complacent, which is beneficial for identity thieves. Much of this raises an important question: Does Google search behavior truly represent how many consumers access and read their credit reports? The simple answer here is yes. While it could be assumed that many consumers are reading their more detailed reports through popular services like Credit Karma, the reality is that a downward trend in consumer interest for credit reports long preceded the easy access to, and interest in, credit scores. Search results on Bing filtered by time reveal a distinct shift in information availability related to credit scores and credit reports. Prior to 2003, consumers using the web were far more likely to find information online about credit reports, with only marginal information available about credit scores. However, between 2002 and the end of 2003, the number of websites referencing credit scores increased over 11,000 percent. That jump in indexed pages referencing credit scores lead to such pages overtaking those referencing credit reports. In 2002, Bing indexed just 82 pages carrying the term “credit score”. By the end of 2003, there were over 9,000, versus 5,860 carrying the term “credit report”. Since then, the number of websites carrying the term “credit score” has been consistently larger every year. The primary factor in this huge shift appears to be FACTA or the Fair and Accurate Transactions Act. Signed into law in late 2003, the Act mandated that each credit reporting agency provide consumers with one free and full credit report each year. Easier access to credit reports may have helped generate more interest across the industry in credit scores as consumers struggled to process the information they were reading in their detailed reports. It may be that this ease of access to reports had an unintended consequence of creating an industry shift, so to speak, away from reports and toward the more easily monetized scores. The US economy is regularly in a state of flux, with ups and downs in economic activity impacting consumer borrowing and spending habits. In the past decade, negative conditions caused consumers to pull back on spending and borrowing, with an observable decrease in revolving debts such as credit cards and car loans. However, the post-Great Recession boom times led to an increase in consumer borrowing. As more consumers find work and receive raises thanks to a tight labor market, they also have more confidence and funds to buy homes, cars, and other goods. Much of that spending behavior is based on a presumed ability to pay in the future, so a fair amount of consumer spending is on credit. From the consumer-facing side, credit is broken into two parts: credit reports and credit scores. Recent data point to a positive shift in how consumers relate to credit, including the fact that more consumers than ever have a solid understanding of their score and the raw number and how it’s calculated. In fact, search data verifies the fact that consumer interest in credit scores, in particular, is increasing. Since 2004 (the earliest year available for Google Trends data), Google searches for the term “credit score” increased over 230 percent. This increase in search interest coincides with a few other notable trends, such as the fact that the average credit score hit a record high in 2018, after hitting a record low following the 2008/2009 housing crisis, and that the average household debt also hit record highs in 2018 (mostly due to large student loan and car loan debts). Furthermore, survey data, such as that available from the Consumer Federation of America, also indicates that consumers are far more informed about how they can benefit from a good score and how they can improve their score when it goes down. However, hidden in this good news may be a bit of an unintended consequence. Even as consumers are more knowledgeable about and interested in their credit scores, they’re increasingly ignoring their credit reports. 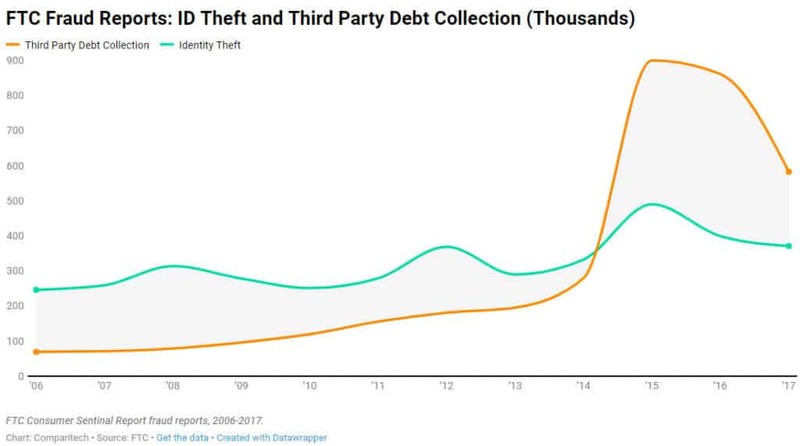 And given the growing threat of identity theft — due in no small part to more data breaches — a lack of interest in and checking of credit reports could leave consumers at far greater risk following a fraud event (more on this later). As stated earlier, consumer interest in credit scores is at an all-time high. The graph charting Google Trends data on searches for “credit score” highlights that growth. There are a few other key search results that reflect consumers’ growing fascination with their credit scores. The reduced search interest in credit reports appears to be taking place at the expense of credit scores. The shift in interest, e.g., the point of takeover for “credit score” versus “credit report”, takes place in 2009, which is consequently not long after Credit Karma came to market. Founded in 2007, Credit Karma’s search volume exploded within a few years, as did its customer base. If this reveals anything about Credit Karma, it’s this: The service stepped in to fill a growing demand for easy-to-access credit scores at a time when consumers were desperate for easily-digestible information about credit. It’s been increasingly clear for years that credit reports are not consumer-friendly, whereas credit scores offer consumers a bite-sized amount of data about their credit that is far less intimidating. Note: Google Trends offers estimated search volumes for up to 5 different terms. When searching two terms together, Google Trends compares those search volumes against each other. They’ll only occupy the same space on a line if their search volumes were the same (e.g., both had 200,000 searches on a given date). However, searching just one term on Google Trends will show only that term’s search volume, meaning it will range from 0-100, with 100 representing its highest volume during the specified time period. The first graph represents data pulled from individual Trends searches. The first chart reveals how each term’s volume changed over time, but separately. The second graph shows those terms compared in the same Trends search, and reveals the vast differences in their search volumes. 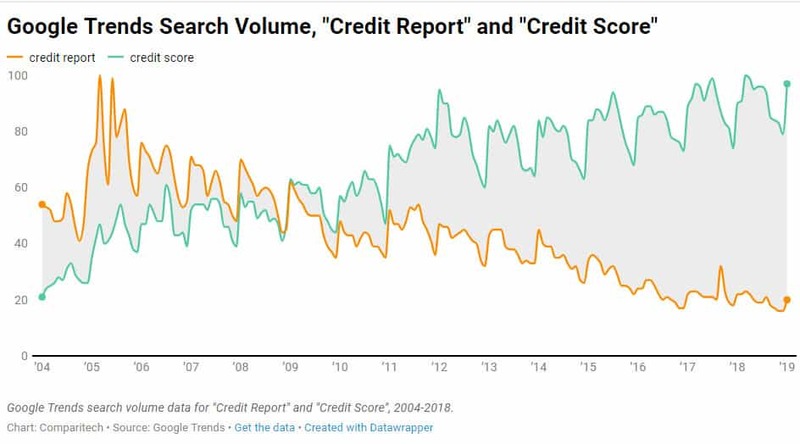 Outside of the year-over-year declines in search interest for “credit report”, there are a few other trends that reflect how consumers are interacting with their credit reports. For example, the data reveal that interest in credit reports experienced a dramatic increase in 2004-2005, likely a lag result of FACTA. Consumer activity related to getting a free, annual credit report thanks to FACTA likely lagged due to the time required for companies effectively advertise those free services to consumers. However, Trends data shows that the annual spike in “credit report” search interest is decreasing. For example, in 2011, the jump in search interest was 48 percent in January, versus December. In 2018, that January increase was just over 29 percent. Not only are fewer consumers looking for credit report information throughout the year, the number of consumers looking to access their free, annually-updated reports at the beginning of the year is also decreasing. Interesting as well is the large jump in search interest for credit reports following the Equifax hack. Although Equifax offered a year of free credit report monitoring to those impacted by the data breach, that free offer wasn’t available until January 2018. A short burst in interest following Equifax’s September 2017 announcement shows the hack was enough to get more consumers suddenly interested in their reports, at least in the short term. The long-term trend following that event continued, however. As well, the Equifax hack did not appear to cause an equivalent jump in search interest for credit scores, which may indicate that consumers are not ignorant of the importance of a detailed credit report, but are indeed simply losing interest in the more detailed reports as credit scores are both easier to access than ever before, and considerably easier to understand. Several media sources report that Equifax’s data was compromised from May through July 2017. According to DarkOwl, some stolen Equifax data was up for sale on the dark web during that time of exposure. Consumers choosing to check their credit reports following the announcement was a good idea. Realistically, however, it may take far more time for fraudulent activity to appear on a credit report. Equifax was not the only company to get hacked in 2017. Over 800 data breaches occurred that year, and over 150 million Social Security Numbers stolen. Consumers’ response to the Equifax hack was primarily a result of its media attention, meaning that less-advertised but still damaging hacks may have also left consumers significantly exposed to fraud earlier in the year, although without the same level of media coverage that might have spurred credit report checking. A consumer’s credit score is calculated based on factors primarily located within their credit reports. Information such as the average age of open accounts, total number of accounts, credit card utilization, and hard inquiries all factor into the score. Different data points have different weights on the final score, and fluctuations in the score are normal. Scores are calculated using an algorithm from either FICO, VantageScore, or other lesser-known services. Consumers who pull their detailed credit reports from any of the three major credit reporting agencies (Equifax, TransUnion, Experian) can see what information exists in the report. However, credit scores can be misleading, especially if consumers are using free credit score services like Credit Karma or Credit Sesame. First, credit scores do not reflect soft inquiries, e.g., when consumers request their own credit reports, when someone performs a background check unrelated to lending activity, or when a company seeks to offer pre-approval for a loan or credit card. Some consumers still mistakenly believe that soft inquiries lower their score, so many completely avoid checking their credit report as a result. Consumers can pull their own credit reports once per year for free from each reporting agency, or at any other time for a fee. Those soft pulls will show up on a detailed credit report for the consumer, but they won’t be reflected in the score, and they won’t be visible to anyone else who pulls a credit report. Identity thieves who have gathered enough information can also make these soft inquiries, or be offered pre-approval for loans or credit cards using a consumer’s information. Unless consumers check their credit reports regularly and closely, fraudulent soft inquiries could go undetected. Because such soft inquiries are an early sign of potentially fraudulent activity, credit reports offer an early warning for consumers to take action to prevent identity fraud, including implementing a credit freeze or placing a fraud alert. The second issue is the limitation inherent with the free credit score websites like Credit Karma or Credit Sesame. Although these sites have made an extremely positive impact on consumer understanding and usage of credit, they also provide just one or two credit agency scores and reports. Credit Karma, for example, provides reports from Equifax and TransUnion, but not Experian, while Credit Sesame provides reports and scores from TransUnion only. What many consumers may not realize is that potentially fraudulent activity could be reported on just one credit bureau’s report instead of on all three. And with hundreds of thousands of consumers filing fraud reports each year and reporting around a billion dollars in losses annually, a failure to thoroughly check all three reports for fraudulent activity significantly benefits identity thieves. A split or “mixed” credit file, in which a consumer has multiple credit files, can occur for different reasons. If you share a similar name to someone, it could accidentally result in a split file following a hard inquiry or report from a creditor, for example. However, split files can also be the result of having too many accounts on your report, which itself could be a sign of fraud. This can result in a lower score, but many consumers likely won’t know that there’s a split file unless they check all three credit reports. If some account information is showing up on only one or two reporting agency’s reports, but not all three, then a split file could be the cause. Although split files are not always due to identity fraud, fraud is a possibility if a split file exists. It could be a result of identity thieves misusing a consumer’s credit information to open multiple accounts. A major, underreported issue within this topic is that of child identity theft. Over 1 million children were reportedly victims of identity theft in 2017, according to Javelin Strategy and Research. The pernicious problem with child identity theft is that children should not have a credit report at all, and parents can easily ignore checking to ensure reports don’t exist. Close family members are quite often the source of childhood identity theft, which may easily play a role in why so few parents check their children’s reports. Nevertheless, as American adults lose interest in their own credit reports, that trend extends to children, resulting in more vulnerability for millions of children who may be left with lengthy and costly credit recovery options once they become adults. Why are consumers ignoring credit reports? If you’ve ever looked at a credit report, the answer here is simple. Credit reports can be confusing to parse through, and most consumers may lack the time, patience, or education to understand what’s being reported. On the other hand, a credit score is simple to understand and simple to learn, particularly when placed in within a color-coded grading scale of “Very Poor”, “Poor”, “Fair”, “Good”, and “Excellent”. If consumers feel they understand what the score means and what steps they can take to improve it, they’re far less likely to bother with checking their more detailed reports, especially if they see positive results. According to FICO, the data analysis corporation responsible for the industry-standard FICO Score, the average consumer score reached its highest point in 2018: 704 (“Good”), out of a possible 850. There are many possible reasons why consumers have developed a stronger interest in credit scores. Easy lending rules that led to the 2008-2009 housing market crash put credit scores on the forefront of consumers’ minds. Those with bad credit only needed to come up a small amount in order to qualify for slightly better rates through subprime loans. Consequently, that same market crash also damaged the average credit score and caused lenders to raise minimum standards and tighten lending, which may have also resulted in more consumers working to raise their credit scores. Interestingly, a Consumer Federation of America survey found that while more consumers reported accessing their credit reports (spuriously contradicting Google search data that reflects actual behavior), the survey also found fewer adults believe checking reports is important. Consumers’ CFA survey results may also imply that many consumers believe checking the limited view of their credit reports through services like Credit Karma qualifies as checking their report. Importantly, Credit Karma and Credit Sesame do provide far more detailed credit reports, but consumers have to take a few extra steps within those systems to access them. The reports available upon logging in offer only a limited and summarized view of the detailed report. Of course, consumers’ increasing preference for fast-paced information may be playing a significant role in the preference for credit scores versus credit reports. As consumers become more accustomed to spending less and less time parsing information, sitting down to read a detailed credit report may be distinctly unappealing, especially when services like Credit Karma offer a quick score and summary that can be reviewed in seconds. Companies have likely bought on to consumer preferences, leading to an increasing number of them advertising credit score services. A collection of data from the FTC, Google Trends, and other sources reveals consumers’ overwhelmingly complicated, and sometimes amusing, relationship with credit reports and scores. There’s a negative relationship between consumers in each US state having a high credit card balance and searching for and accessing their credit scores, or looking up “Credit Karma”. Perhaps more interesting is the positive relationship between FTC fraud reports and consumer search behavior. There’s a strong relationship between FTC fraud reports and consumers searching for “credit report”, and a noticeably positive relationship between FTC identity theft reports and “credit report”. This relationship shows that consumers who are victims of fraud or identity theft are interested in their reports, but may also indicate that consumers are particularly reactionary when it comes to checking their report and only check after suspected fraud has occurred and led to a financial loss. The search pattern following the widely publicized Equifax hack can serve as a case study to verify this fact. For more state-by-state comparisons, click here to go to Tableau Public. The growth in data breaches and fraud, as well as reduced interest in credit reports, may ultimately leave more consumers at risk for financial losses due to fraud. However, there are a few steps consumers can take to help reduce their risks. A good place to start is annualcrediterport.com. This is the website set up following FACTA that offers all three credit reports, in detail. These versions of the report also include soft inquiries and can be used to identify potentially fraudulent activity, inaccuracies, or split files. Checking your credit report regularly is the best way to help identify problems and reduce potential damage from fraud. But checking your report can also turn up more common, but not fraudulent, inaccuracies that could be keeping your credit score artificially low. An FTC study found that 1 in 5 Americans had a “potentially material” error on at least one of their credit reports. Additionally, the finding found that many consumers who disputed these inaccuracies received a bump in their credit score of around 20 points when the inaccuracies were resolved. In general, checking credit scores alone is not a sufficient way to stay educated about one’s credit activity. However, the FTC’s study offers a solid reason why fraud can easily go undetected: If inaccuracies or fraudulent activity only exist on one CRA report, it’s likely to go under the radar until the damage is done. Realistically, checking credit scores and reports can be a hassle. Without reminders, many consumers may not check them at all. And when they do check reports, the documents themselves can be confusing to read and understand. This is where credit and identity monitoring services can help relieve some of the pressure. These services, which include more well-known companies like LifeLock, and lesser-known services like IdentityForce, monitor credit reports for any changes. That said, many banks and even Credit Karma now also offer credit monitoring, making the paid services appear a bit less attractive. And for those who received free credit monitoring and credit locking (similar to a credit freeze) from Equifax: that free service ended on January 31, 2019. You can relock your Equifax credit report for free using the company’s Lock & Alert service. Many of the paid services provide additional monitoring options that can help reduce the risks associated with identity theft, including dark web monitoring for personal information (such as SSNs, addresses, credit card numbers, and bank information), and even reputation monitoring on social networks. Quite understandably, there are distinct limitations to both paid and free monitoring services. None of the free third-party credit monitoring services we’ve researched cover all three CRAs (Equifax, TransUnion, and Experian). We’ve been unable to verify whether any of the paid third-party monitoring services monitor all three bureaus. Some of the paid third-party services appear to intentionally leave out critical information regarding what CRAs they monitor. The only way to get credit monitoring for all three CRAs is to sign up for the monitoring services offered by either Experian or Equifax. That said, no credit monitoring service we have found issues alerts for inaccuracies between the three reports, nor do they issue alerts for split files or soft inquiries. Consumers still need to perform their due diligence and manually check all three of their reports for inaccuracies and potentially fraudulent soft inquiries. There’s little consumers can do to stop data breaches. However, anyone can employ a few best practices to help keep their data private. Credit scores have been a part of the consumer credit market for decades, after an introduction by Fair, Isaac and Company (now FICO) in the late 1950s. During most of that time, consumers had only limited access to their credit reports and scores. 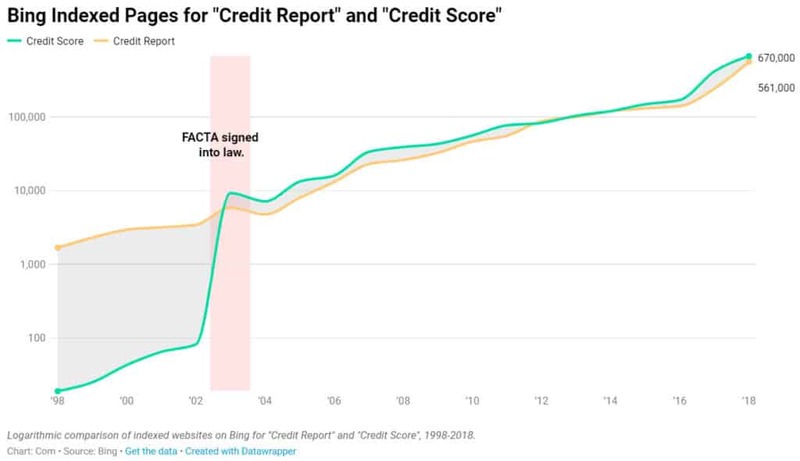 When FACTA passed in 2003, Americans for the first time had free, easy access to their credit reports. And for the first time, many consumers likely came to the realization that credit reports can be confusing to understand. However, the strong desire to have more control over one’s own credit became part of the public consciousness. The lending market and associated businesses appeared to respond accordingly to the demand for access to credit information, and the internet served as an easy medium to make that happen. The proliferation of free credit score sites is likely a response to both FACTA and consumers’ growing understanding of how their credit plays a role in achieving the American dream. It’s also worth noting that this new market appeal of credit scores was something many businesses recognized could be easily monetized. For example, Experian, Equifax, and TransUnion coordinated to bring their consumer-focused VantageScore to the market after it became apparent that credit information could be more easily monetized through scores. Now, these services offer VantageScore for free, as a means to more easily compete with the more well-known FICO score which remains locked behind paywalls for consumers. While FACTA was originally designed to give consumers easier access to their credit reports, the unintended consequence may have been to move consumers further away from reports and toward scores. Consumer interest in scores need not come at the expense of reports, but it’s a logical conclusion that consumers would be far more drawn to the convenience of quickly checking a score, versus laboring over the details in a report. A simple solution may be for sites that have a lot of influence on consumer behavior, such as Credit Karma, to push credit reports more aggressively than they currently do, and to make it easier for consumers to locate the full report instead of a summary. Nevertheless, consumers may need to be more proactive and, at the least, access and thoroughly review their free credit reports annually. 2 Why is increased credit score checking a problem? 2.1 Unintended consequences of FACTA? 4 Why do credit reports matter? 4.3 Why are consumers ignoring credit reports?